Dr. Michael Haltzel publishes Insights on the Balkan Wars and NATO enlargement. AHF submits statement to Congressional Committee on Foreign Affairs, Subcommittee on Europe and Eurasia discussing minority rights and calling for rehabilitation of Janos Esterhazy. AHF and the Central and East European Coalition participate in a reception and Capitol Hill Policy Seminar entitled, "20 years: Three Perspectives on the Evolution of U.S. Strategic Engagement with Central and Eastern Europe." AHF Reacts to Senator Benjamin L. Cardin (D-MD), Co-Chairman of the U.S. Helsinki Commission, who questioned democracy in Hungary and criticized expressions of concern for Hungarian minorities. AHF Expresses Concern About Rumania Ignoring Minority Rights... Romania considers "redistricting." Ronald Reagan statue unveiled in Budapest’s Szabadság Tér. On the 91st Anniversary of the Treaty of Trianon, AHF remembers the ill-advised treaty and publishes essay by Sir Bryan Cartledge who called the treaty "the greatest catastrophe to have befallen Hungary since the battle of Mohacs in 1526." AHF Disaster Relief Fund surpasses $230,000.00! But the effects of Flooding and Toxic Sludge are NOT OVER!! See how your support is helping the victims. Add your name to the Wall of Honor! 6/4/2011 -- On the 91st Anniversary of the Treaty of Trianon, AHF remembers the ill-advised treaty and publishes essay by Sir Bryan Cartledge who called the treaty "the greatest catastrophe to have befallen Hungary since the battle of Mohacs in 1526." 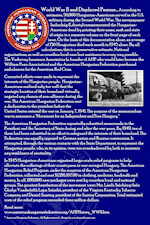 Over the course of its more than 100-year history, the American Hungarian Federation has commemorated the Treaty of Trianon, highlighting the gross injustices wrought by that treaty (better described as a diktat) and the entire Versailles so-called peacemaking. Trianon continues to plaque the region. Sir Bryan Cartledge is also author of The Will to Survive: A History of Hungary (2007 and published by Columbia University Press in 2011) a highly acclaimed volume by the former British diplomat. Buy it now on the AHF Amazon Store! Deborah Cornelius’ Hungary in World War II: Caught in the Cauldron (Fordham University Press, New York 2011) gives an excellent overview of the events leading up to and the horrendous events of World War II in Hungary. 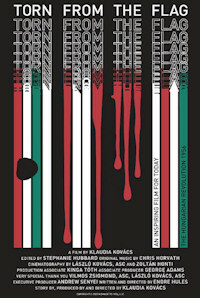 The effect of the Treaty of Trianon, that without plebiscites, truncated Hungary and deprived it of its natural resources and forced a sizeable portion of its population to live under alien jurisdiction, set the political and sociological climate in Hungary from the 1920's on. Cornelius gives an excellent overview of the readjustment that expressed itself in the politics and led to the belief that revision of the treaty was only possible through German intervention. [read more] and buy it on AHF's Amazon Store. 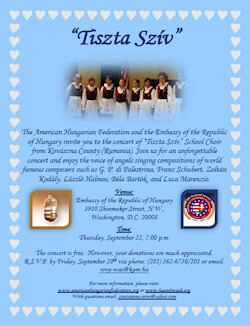 The Hungarian Community Club is pleased to present a unique opportunity to listen to 'Tiszta Sziv' - or 'Pure Heart'. This incredible Girls' Chorus from Transylvania will be at the club, 147 Ward St, Wallingford, Ct, on Tuesday September 20, 2011 at 7:30 pm. The chorus will feature selections from classical ecclesiastical and secular works, folksongs and compositions by Bardos, Bartok, and Kodaly. Songs will be performed in both Hungarian and English. Admission is free, but voluntary contributions will be gratefully accepted to help defray costs. 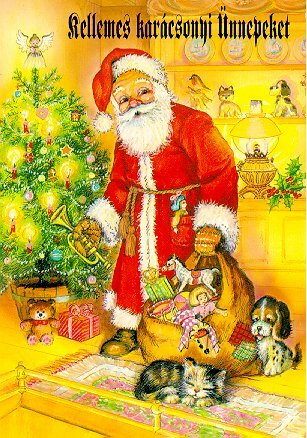 Light snacks and resfresments will be available. For information please call Barbara (203-269-9768), Linda (203-634-0602) or Kathy (203-213-3775) or email us at HCCofWallingford@gmail.com. For more upcoming events or to join, visit their Website. Florida celebrates the Franz Liszt Bicentennial! The Honorable Helen M. (Ilona) Szablya is the Honorary Consul General of the Republic of Hungary for the States of Washington, Oregon, and Idaho based in Seattle. Each year, the Ethnic Heritage Council honors a naturalized citizen who has made outstanding contribution to the U.S.A., while maintaining his or her ethnic heritage. Congressman Jim McDermott presented her the “Spirit of Liberty Award" on July 4, 2011, at the the Ethnic Heritage Council's 27th Annual Naturalization Ceremony at Seattle Center where over 500 people, from more than 75 countries, were sworn in as new citizens of the United States of America. Born and raised in Budapest, Hungary, she is an award-winning author, columnist, translator, lecturer, and publisher. Her books are available on the AHF Amazon Store! [read more] about Helen!